Well, things didn't go quite as expected. After setting new NFL records for touchdowns and points scored this season, Denver's offense saw its first seven drives go something like this: Safety, punt, interception, interception returned for a touchdown, turnover on downs, punt and fumble. The statistical best offense in league history had produced -9 points directly, and gave away another 14 points off of turnovers. Seattle led 36-0 in the third, on it's way to a dominant 43-8 Super Bowl victory. Well, a few things, actually. The Broncos were, at first, seemingly afraid to push the ball down field against Seattle's "Legion of Boom" secondary, leading to a number of slip and wide receiver screens. Pete Carroll and the Seattle coaching staff correctly anticipated this, as the right side of the line, Brandon Mebane and Chris Clemons, seemed to always be on the lookout for them. As was right corner Byron Maxwell, and it became very clear that Denver wasn't going to try these screens to Richard Sherman's left side. The screens were sniffed out, but Demaryius Thomas also didn't help his team, constantly running east to west and losing yardage, rather than getting down hill and picking up first downs. I know it doesn't seem like much in a blowout like this, but an extra three yards on two of those screen passes in the first quarter, when the game was still 5-0, may have changed the entire complexion of this game. The Denver offensive line also simply couldn't hold up. Defensive end Cliff Avril was abusing right tackle Orlando Franklin, and his quick pressure led to both of Manning's first half interceptions. The Broncos were also incredibly underrated running the ball this year, but mustered just 1.9 yards per carry against Seattle's vaunted front. Much of this will fall on Manning, but when you can't protect your quarterback for 1.5 seconds, and your backs have nowhere to run, there is zero chance you're going to be able to score points against, arguably, the greatest secondary in league history. But let's not let Manning off the hook entirely here, because with every big game loss comes some questioning of the quarterback, especially if that quarterback is Peyton Manning. He's been known as a guy that can't win the big one throughout his career. Even after he won his first Super Bowl in 2006, people still believed a player as great as him needed multiple titles. When little brother Eli Manning, a far inferior quarterback by any measure, won a pair of Super Bowls from 2007-2011, it only reminded folks that Peyton had a measly one ring. And it's not just the way he lost this game, it was the fact that the entire offense, a well oiled machine throughout the year, looked unprepared and out foxed. 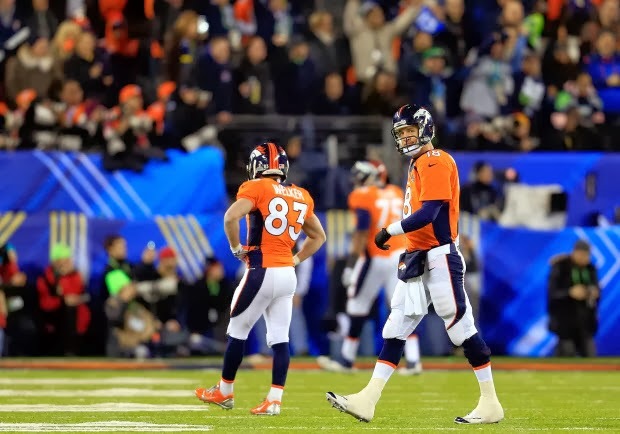 It was the fact that, in an almost poetic reference to his statistical greatness but inability to win championships, Manning set a Super Bowl record for completions while his team lost by 35. People will say that one game doesn't define a legacy, and that is true. Peyton Manning is still one of the greatest quarterbacks to ever play, but losses like this affect the way we remember the great ones. I was discussing the greatest quarterbacks ever with my oldest friend, our boxing contributor Warren Rodriguez, and we both agreed that Joe Montana was the best. My argument was that he had the best combination of winning and statistical greatness before the league totally changed, and that he was a Top-3 quarterback for a decade. Warren had a slightly different, less scientific, take on it, and I think I like his better. When I brought up my other candidates, Johnny Unitas, Tom Brady and John Elway, he reminded me that all of them had not only lost Super Bowls, but they had lost historic Super Bowls or been embarrassed in the big game. Unitas fell victim to a huge upset, and Joe Namath's guarantee, in Super Bowl III, while Elway lost three Super Bowls in the 80s by a combined 95 points. Brady, for all his greatness, has now lost to the lesser Manning on Super Sunday TWICE, and did so with arguably the greatest team in NFL history around him in 2007. He has also gone a decade without winning a title. For all the "winner" talk around Brady, he hasn't won the big one since he became an elite quarterback. He was a pretty good QB for his three championships, but not the player he is today. Heck, we rag on Kobe's first three rings because he had Shaq next to him, but for some reasons we view Brady's titles differently. You can add Peyton Manning to this list after that dreadful performance against Seattle. All of those guys are in the conversation for best ever, but we just don't have a memory like that of Joe Montana. For that reason, along with he and Bill Walsh's reshaping of the NFL passing game, plus four Super Bowl wins, I gotta go with Joe. A few weeks back, in preparation for the conference championship games, I ranked the Top-10 QB seasons and Top-10 defensive seasons in league history. Peyton Manning finished No. 2, behind 1984 Dan Marino, on my list of the best QB seasons, and after this performance, I think I'm going to leave him right there. Like Marino, Peyton led the best offense in football into the big game, and was handled by the best defense in football. In '84 it was the 49ers, but Marino's team at least avoided total embarrassment, losing 38-16. Still, you could make the case that both passers were humbled in their final games of historic years, and the same goes for No. 3, the 2007 edition of Tom Brady. I know that "defense wins championships" is an old cliche that has been debunked many times, but at least in these cases, great defenses have won out against historic offenses. Speaking of defense, I had Seattle's "Legion of Boom" ranked No. 10 on my initial list, and I think it's time to move them up a bit. Not just because they won the Super Bowl, but because they had, in my opinion, the most impressive defensive performance in Super Bowl history. What they've done in an offense-happy league is nothing short of amazing, and I would move Seattle up from No. 10 all the way to a tie for No. 7 with the 2002 Tampa Bay Buccaneers. You're splitting hairs between the two best pass defenses in modern league history, and both dominated great offenses in the big game. Not to mention, both run the 4-3 under alignment as well as anyone, though Tampa ran it's famous Cover 2 behind it, while Seattle opts for a Cover 3, man-up hybrid. Either way, they jump the 2008 Steelers and 1975 Los Angeles Rams, something that I think is justified given their playoff run. Be on the lookout for our final two "The Good, the Bad and the Ugly" pieces. The first coming tomorrow, recapping the Super Bowl, and the final on Wednesday, recapping the entire 2013 season.